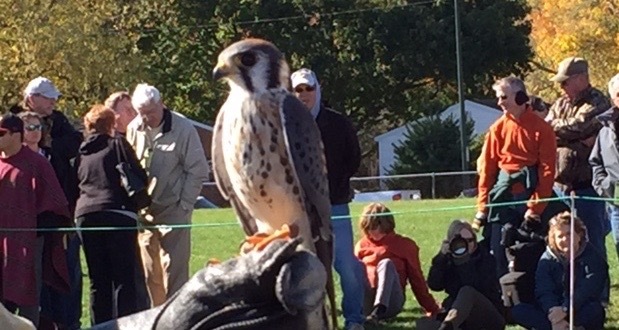 I recently had the pleasure of seeing master falconer Brian Bradley give a demonstration of raptors (birds of prey) at the Waterfowl Festival in Easton, Maryland. This was the second time I’ve seen his presentation and I was just as fascinated this time around as I was the first. Since I spend my life working to create happy households in which both humans andpets harmoniously coexist, I am always drawing parallels between what I observe in other disciplines and what I see in my own little world of companion animal behavior medicine. The raptor demonstration provided many such parallels but I will limit myself to the three that really resonated with me. Some animals don’t have the raw material to do the job they are asked to do. Brian hunts with falcons and hawks, and prefers to catch his birds from the wild. He explained that for his hawks, he is permitted to only catch birds in their first year of life. He trains them and hunts with them for 2 years or so, and then releases them. It is important to understand that when he does hunt the birds, they are free flying and could decide to end the relationship by simply not coming back. There are no “shock collars” or tethers on these birds. But, because Brian gives them food necessary for survival, and a full 70% of Red Tailed Hawks don’t survive their first year of life in the wild, the promise of consistent food source is a big payoff for the partnership from the bird's perspective. Brian also describes something we pet people know with certainty about our animal companions—they all have different personalities, even if they are the same breed or even siblings. And Brian does report that sometimes he encounters a bird that he describes as “too scared or too stubborn” to do well in the partnership. Instead of making both himself and the bird miserable by having unrealistic expectations and setting the bird up for failure, Brian will release the bird. Often my clients have specific expectations for their dog or cat when they adopt them. Maybe they want a lap cat but their kitten grows up to not care much for snuggling. Or, in my case, I adopted a Doberman puppy through rescue some years ago, hoping to do therapy work with him. He turned out to be a pathologically anxious dog and I often joked that he was not able to do therapy because he needed therapy. I generally tell my clients to envision "the pet they wanted" and then envision "the pet they got." At that point, they need to eliminate the “pet they wanted” fantasy and focus only on the living, breathing, sentient animal who is now in their care. This includes being grateful for all of the positive attributes of their pet rather than only dwelling on the challenges. Some animals will remain phobic of certain things despite repeated exposures, even if they have never had a bad experience with the trigger. Brian is careful to manage his birds when there are dogs in the audience. NOTE TO DOG PEOPLE: If the program says don’t bring dogs, then don’t bring dogs! At any rate, his owls are terrified of dogs and will remain fixated on any dog in the vicinity. Brian has had his owls since a few days after hatching and they have never been attacked by a dog. However, their innate fear of dogs (or dog-like creatures—coyotes, wolves, foxes, etc.) persists despite repeated, “positive” exposures. Some more constitutionally nervous animals will be frightened of things the very first time they encounter them. My nervous Doberman was terrified the first time he saw a family member pick up a pool cue to play pool. He had never been struck by anything but had an innate fear of us holding such an object. Likewise, a few of my parrots are afraid of long, tubular items, like stethoscopes and hoses. We presume this is because snakes are predators and it pays to have an innate fear of things that might kill you, as you probably won’t get a second chance if you don’t err on the side of caution. it would be more effective to recognize this fear and accept it as perfectly logical and adaptive at some point in your pet's personal or evolutionary history. Then you can work on methods of avoidance, distraction, and desensitization and counterconditioning. But bear in mind that some animals may have such an entrenched phobic reaction that attempts to behaviorally modify their response may not be completely successful. And, it is not because your pet is stubborn or stupid. It is basic wiring for survival. Working (and living) with animals is a partnership. Brian emphasizes that he and his birds are partners on a team that allows the birds to hunt successfully. This team also includes four impossibly cute miniature Dachshunds, whose job it is to flush out small game like rabbits for the hawks to hunt. Unlike many of our pets, who are constrained and restrained, Brian’s birds have a choice. When they are out hunting with Brian, especially the “wild caught” birds, they could choose to fly off and not return. BUT, Brian gives them a very good reason, e.g., a reliable food source, to continue participating with the team. And being partners, Brian emphasizes how important it is to read his birds’ emotions so he can work with them effectively. I believe the partnership model is an effective way to conceptualize our relationships with our pets. Back when I was 20 years old and adopted my first dog on my own, I spent very little time thinking about how I would be able to give him the type of life he needed. I thought of him more as an acquisition that would give ME what I wanted—companionship and safety, as a 100 lb Rhodesian Ridgeback was a comforting presence while living in West Philadelphia. Now, when I contemplate bringing a pet into my life, I spend much more time thinking about MY contribution to the relationship and whether I am equipped to offer my partner what will be required for a happy and contented life. Since we are the ones who initiate our partnerships with our pets, it is up to us to lead the team so that it is a win-win experience for all. Expectations that our pets will simply provide us with what we desire without us considering what they need are likely to be met with disappointment. If we are to have a happy, contented, pleasant life with our pets, we need to think of them as our partners, figure out how we can work together to provide for everyone’s needs as best we can in our imperfect world, and be able to read them so we know what they are communicating to us. Training that does not involve intimidation, fear, or pain will allow us to be able to have a common “language” and promote a good working relationship with our pets. Just watch Brian and his birds. It is a pretty impressive example. My unlikely flock chooses to join me while I write this blog. My dog chooses to continue napping undisturbed!